Browse: Home / 2012 / August / 27 / Arctic Ice Loss: Temperature Or Soot? There is much wailing and gnashing of teeth lately about the declining Arctic Ocean ice. Pierre and I have written several articles discussing the roll of soot and dust assisting melt of both the sea ice and the land ice on Greenland and other locations around the world. See here, here, and here. But the warmists have always pointed to CO2 and “Global Warming/Climate Change” as the culprit behind the decline in Arctic ice. But proof has been lacking. The major source of northern hemisphere soot and dust is Asia, chiefly China. They currently use over 3 billion tons of coal annually, and this amount has been steadily increasing with but one hesitation in the mid-1990’s. The question then becomes: What are the relationships between temperature and ice decline, and China’s use of coal and ice decline? The figures used were from Wikipedia for the annual coal production, and WoodForTrees for the annual average UAH satellite temperature and NSIDC NH ice index. The time period examined is the 30-year satellite era from 1980 to 2010. It is clear from the charts that coal use in China is the primary culprit in the loss of Arctic Sea ice, especially in the last ten years. The R-Squared value, the goodness of fit, is almost twice that for global temperature. An R-squared value of one would mean a perfect fit… that is, the data all lines up on the trend line. As long as China continues to burn vast quantities of coal with few attempts to clean up their particulate emissions, their unintended effort to melt the Arctic will continue. I like how all the focus is on the Arctic, nowadays. But when we look at the entire globe, 90% of the world’s ice is stored in Antarctica. In the wintertime, the South Pole is covered by almost 30 million sq. km of ice. That’s almost 100 Germanys! And when we look at the total global ice statistics there has been only a little cyclic-related melting. And as Ed mentions, a good part of it may be due to soot. I think the Arctic ocean SSTs are the culprit. 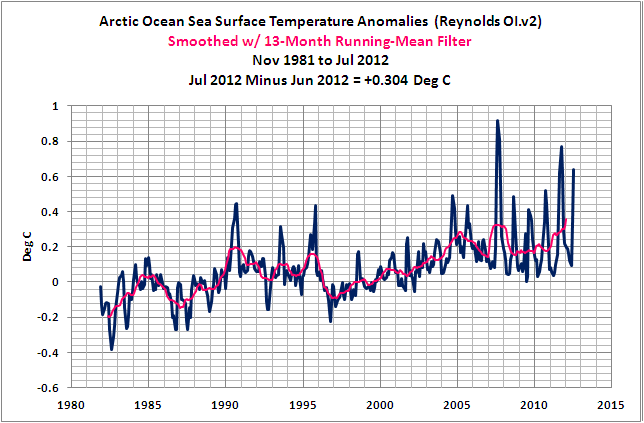 In 40ties at similar temperatures, NW passage was open just like in 2007. Soot drives ice loss, drives sea surface temperature. Before China began burning so much coal, arctic air temperature drove ice loss. Soot has taken over. The 1998 El Niño just barely filled in for the hiatus in coal use in China in those years. Since then it’s all coal use. Carefull correlation does not equal causation. Remember the CO2 rise temperature rise correlation. What correlation? Run the numbers. Don’t have any numbers. Just saying the soot theory sounds just like the CO2 rise equals temperature rise. Since my interest in the AGW scam started, the anecdotes suggest that the sea ice receded in the 30s/40s. Trips through the Northwest passage and all that. CO2 rise doesn’t equal temperature rise. The storm is noise. If it were not for the variability of winds, the correlation with soot would be closer. So the artic sea ice will not recover to say 1980 levels with the shift to the cooler PDO??? The north Atlantic does more than the Pacific. I just ran the numbers for mwhite. For the last 30 years, the R-squared value for CO2 against GISStemp is 0.751. The value against the satellite temperature (UAH) is 0.502. I take that only as proof that GISS has fudged the data. I have an alternative theory: rising temperatures encourages economic activity in China, thus causing more coal to be burned and more soot to be deposited around the world. At the same time rising temperatures cause ice loss in the arctic. In other words, your correlation between China coal use and ice could well not show any causation. The problem with your alternative theory is that there is no established mechanism that makes economic activity rise due to higher temperatures, but that there exists widespread recognition that soot accelerates ice melt. Please propose a mechanism why higher temperatures should lead to higher economic activity.